Camping and tailgating go hand in hand with great food and this King Kooker Outdoor Cooker and 5 gal. 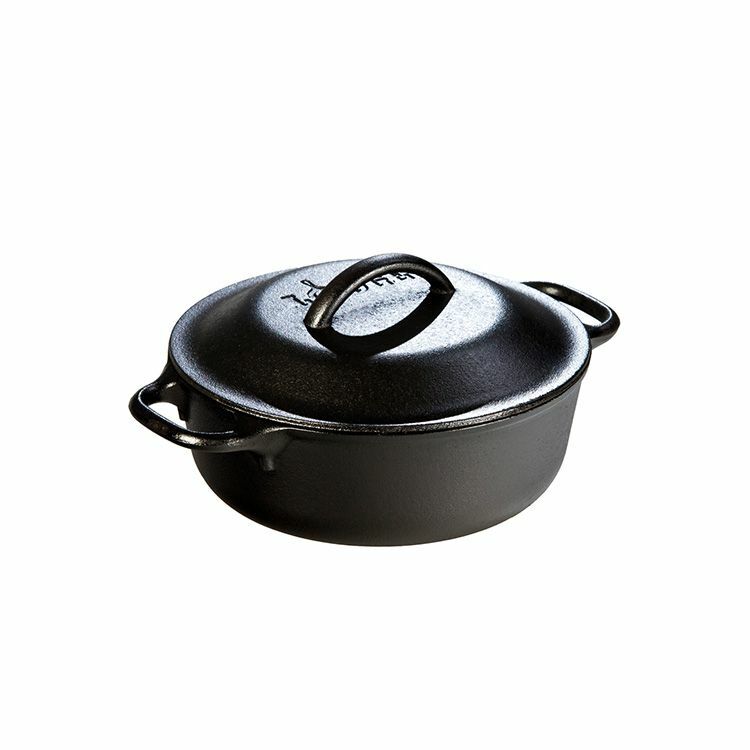 Cast Iron Pot Package. Great for Jambalaya, Gumbo, Chili, Soups and Stews! Cook large quantities of food in the 5 gal. cast iron pot that sits securely in the recessed top ring of the heavy duty outdoor cooker. The cooker has a 60,000 BTU cast burner, and two steel helper lifting hooks come in the package for lifting and moving the cast iron pot. Cook all your foods to perfection every time. Try the suggestions in our detailed instruction and recipe booklet, or create your own favorites. King Kooker lets you eat like a king. CSA Design Certified. The cooking possibilities are endless with King Kooker's UFO (Unique Deep Fryer Dutch Oven). Use less oil when frying pork chops, cauliflower or wings with this two level 9 Qt. Pre-Cast Iron Dutch Oven. Steam tamales or seafood with the steam plate, or blacken fish or chicken. Pan Fry! Deep Fry! Stir Fry! Steam! King Kooker lets you eat like a king. 1qt. Cast Iron Serving Pot Since 1896, the Lodge family has been casting premium iron cookware at our Tennessee foundry. As the sole American manufacturer of cast iron cookware, we are proud to carry on the legacy started by our great grandfather Joseph Lodge. We don`t just make products; we make heirlooms that bring people together for generations. At home in the backyard, the backwoods, or the ballgame. Brutally tough for decades of cooking.